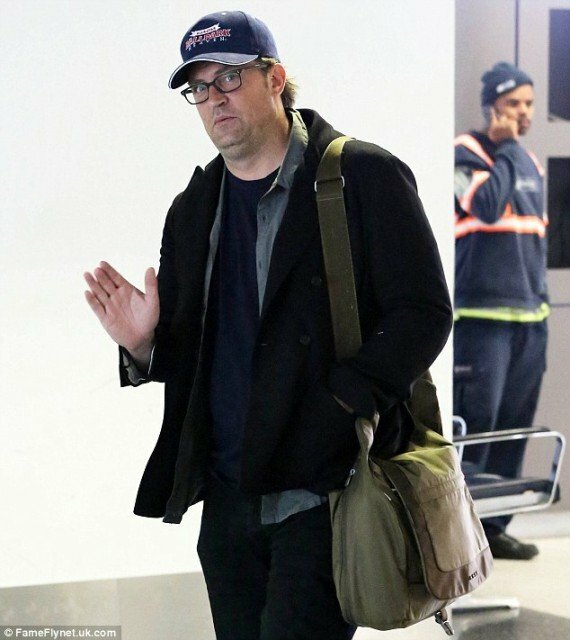 Matthew Perry’s fuller face revealed that he has gained even more weight in the past month as he arrived at Los Angeles International Airport on Friday. Matthew Perry, 43, has won his hard-fought battle with drugs but now seems to be fighting with the scale as his weight yet again fluctuates. He appeared somewhat bedraggled as he walked though the sprawling airport with a scruffy shirt covering his black T-shirt, a green bag flung over his shoulder and a baseball cap on his head. Matthew Perry also wore a rare pair of studious glasses and a thick coat despite the sunny California weather outside. After winning the hearts of millions of Friends viewers as Chandler Bing in the 1990s, Matthew Perry was last seen in Go On, a comedy drama that aired in the US on NBC last year but was canceled after one season.